Four Vineyarders who fish tell us how (and why), and how they cook their catch. What got you started fishing? We all grew up in my father’s fish market, Amaral’s Fish Market in Oak Bluffs. It was the early ’40s. As soon as we got out of school at 3:15, we had to be in the fish market at 3:30 with our aprons and our boots on, and open scallops until 6 o’clock or so; then get washed up for basketball practice. Rushing home to open scallops. Thousands and thousands of scallops I’ve opend in my past. I used to go with my father to Chilmark, Gay Head, and Menemsha, to buy scallops from the guys up there. We’d open the panel truck, weigh them up on the scale and pay cash right there. That’s how I got to know all what I know today. Is this the original scale used to weigh fish? That scale we used in the ’40s and ’50s, and it’s still right on. We took it on the truck to pick up fish. When we made the stop, you unhooked the hook, moved the bracket out, and brought the scale down. See those ice tongs up there? That’s what we used for the 300-pound blocks of ice; there was no refrigeration then. We used to get the ice delivered to the fish market from Uncle Seth’s Pond and the ice house at Crystal Lake over in East Chop, that’s how we kept things cold. On April 1, when the freshwater ponds opened up, we’d get our licenses and go trout fishing and perch fishing. I’ve been in every pond on the Island: Upper Chilmark, lower Chilmark, Deep Bottom, West Tisbury, Edgartown Great Pond, Watcha Pond. I’ve only missed one Derby; that was when I was in the service overseas in Korea. 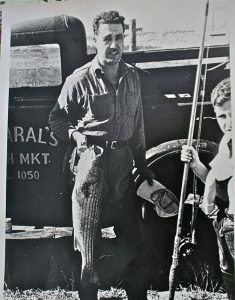 I’ve been fishing for striped bass, bluefish, and shellfish consecutive years since 1957. Right now I’ve got 60 years when I haven’t missed fishing. I fish May through November. One fall I caught five striped bass 50-pounders. The first one came the Monday after the awards ceremony: 53 pounds. 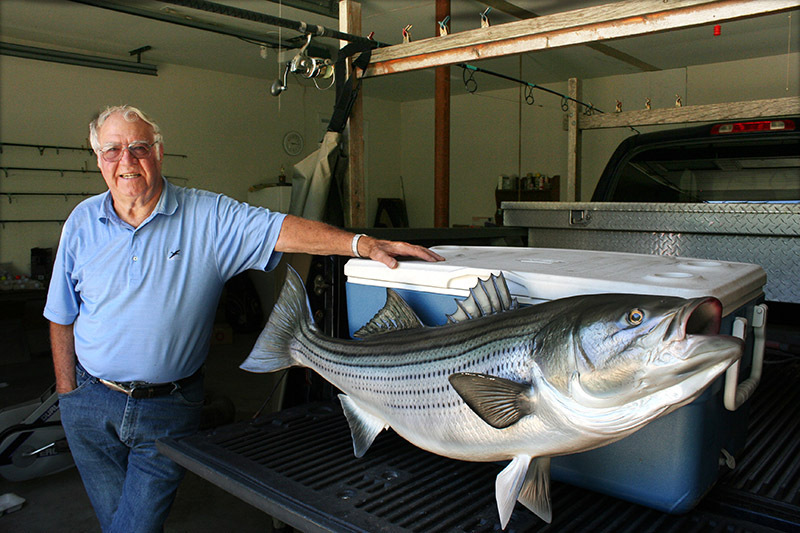 Then the next night I got the one hanging up on my wall — he was 56½ pounds. I kept on fishing through the end of October, then the first week in November I went up to Zack’s Cliffs up in Gay Head and I got three 50s all in one night. Tommy Taylor, Bernie Arruda, and David Offer came over to me as I had two 50s on the beach. Back then Albert Fischer and I fished together — he and I go way back — he used to let me deer hunt over there on the back side of Squibnocket Pond, when he was caretaker. I’ve hunted from the Gay Head spring right clean to the water, all around Squibnocket Pond. There’s nothin’, nothin’, nothin in this fishing game that you play that says, “You are gonna get a fish!” You don’t know what you’re gonna get until you put your time in, and then when you think you’ve got it all figured out, and you go back and fish another night — you get nothin’! So many times I’ve gone without gettin fish … It’s a crapshoot. What tides to go with, what wind to go with. If the wind is wrong on one side of the Island, then there’s always another side to go to. Bottom line is, You can’t get them on the couch! Favorite fish to eat, and how would you cook it? The trouble with me, I’m so busy that I don’t have time to do the cooking. If I cook fish I like swordfish, and my fillet of sole. The bass you’d have to broil, or put it on the grill. I gut fish that I give to everybody that takes care of me. I give them fish, I give them scallops, I give them deer meat. I learned a long time ago from my father and my uncles: the people that take care of you, you take care of them. I get such a big kick out of seeing the smiles on their faces … that’s all I need. I don’t surfcast as much as I used to. Fly fishing is my first choice. I’ve been saltwater fly fishing here for maybe 20, 30 years, when there weren’t many people doing it. I used to spend all night up on Lobsterville walking and fishing … fly fishing at night is fun. Tell us about your fishing history. I’ve had a captain’s license for 25 or 30, years and chartered on my boat, Tippet, a 23-foot Boston Whaler. In fly fishing, tippet is the section of the line that determines what weight you are using. I grew up on a freshwater lake in Michigan, fishing with my father. He would take me trout fishing, and he liked to fly fish. Fly fishing is a whole different way of doing it: It’s a different rod, a heavier line. In a way, it’s almost like an art form. If you hook a fish, you can feel every little wiggle. It’s the action of the rod and the weight on the line that gets the fly out there. I’ve fished all sorts of places — down to the Keys, Costa Rica, the Bahamas, Christmas Island, Belize. I’ve had up to a 120-pound fish on a fly rod. I’ve caught some good fish here, but the big ones have been elsewhere. Several are in the world record books — I’ve been fortunate with that. During the winter I go to someplace warm where I can fish with a fly rod to get different fish from what we have around here. My fly rod has taken me everywhere, meeting some wonderful people along the way. My first winner was a Pacific jack crevalle caught on a long-range boat off of Cabo (a place called Todos Santos). The exciting part of that is it was before there was a women’s division in the fly rod. There were five women in the Fly Rod World Record book at the time, and I knew four of them. I’ve gotten to know the top fly fishermen all over the world. What’s your favorite fish to catch? Probably the stripers are fun here; for eating, the black sea bass, that’s easy fishing. With the fly rod it’s tarpon or bonefish or sailfish. The sailfish, like the marlin, has a big fan for a dorsal fin. To hook one of those on the fly and see him jump is really exciting. Your favorite way to cook fish? Different ways. The black bass, I like to do them with egg and crumbs and fry them hot in the pan. Any of that fish: Cook it fast in the pan. My favorite thing to do with bonito is to smoke it. I steak it and smoke it rather than fillet, like a tuna steak (a different way of cutting them) so that it doesn’t get dried out. Then I seal them in a vacuum pack and put in the freezer. I tie flies … I make the flies. I must have 100 different materials in my basement — different hooks depending on what fish — all sorts of sizes and materials. If I am going after bonefish, it’s one kind of fly; if stripers, it’s another kind. Bonito, another one. Some look like a crab … they all have different names. You pull the fly through the water, that makes the action — that attracts the fish when they see that motion. Here at Larry’s Tackle, they’ve put me in charge of the fly fishing section. the stages of fishing: First of all to catch any fish; the next thing is to catch a lot of fish; then to catch something spectacular. There’s that old saying, God doesn’t count the days you’re fishing in your life total. If God says I have 750 days, for every day I fish he doesn’t count that as one of those days. Just to be out on the beach or out on the water, whether you catch fish or not — it’s just a neat thing to do. I’ve been trying to catch a permit on the fly rod for some years now. For fly fishing it’s called “the fish of a thousand casts.” I’ve hooked one, but not caught a permit in all these years. Permit are not on the Vineyard, as it’s a warm-water fish. They are a challenge with a fly — if you hook one, you’ve got a big fight. I’ll probably go back to Ascension Bay, or southern Belize, to try again. 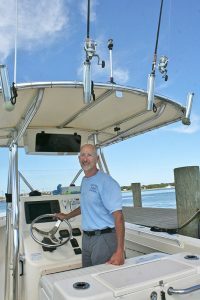 Kurt Freund, captain of captain of Fishsticks Charters in Vineyard Haven. What brought you to chartering on the Vineyard? I’ve been fishing all my life. 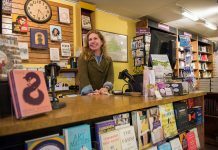 After I left grad school, I worked as a deckhand on a charter boat in New Jersey for a season before giving in to pressure to get a “real job.” I started coming to Martha’s Vineyard for vacations in the ’90s, while I was living in Pennsylvania. 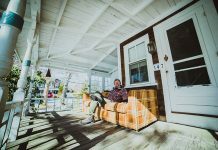 My charter business started when I moved to the Eastern Shore of Maryland and had three seasons on the Chesapeake Bay before I moved to the Vineyard in 2006. Here on the Vineyard I do light tackle and fly fishing trips aboard my 26-foot Jones Brothers Cape Fisherman, Fishsticks. Do you fish and charter only in season? Charter fishing is seasonal, of course. It’s my full-time occupation for about six months of the year. My season starts in May, and really gets going in June. I’m on the water just about every day in July and August. Things start to taper off in September, and I’m usually done with charters about the time the Derby ends. What fish are your clients catching? We had a phenomenal spring season for striped bass this year. Bass fishing in May and June was better than it’s been in years. July is usually all bluefish, all the time, but recently, the black sea bass have outnumbered the bluefish. I’ve had much better luck with fluke fishing this year than I’ve had in several years. I love fishing for bonito, and that usually gets good in August, and by Labor Day, there will be false albacore as well. Since I got my new boat, I’ve been doing more offshore fishing for tuna and mahi. As the water cools in the fall, striper fishing will pick up again. Later in the fall, I love fishing for tautog, or blackfish, as they are also known. Do you ever have a surprise catch? Yes, that can always happen. I’ve caught two triggerfish, a tropical species more commonly found on reefs. One was in Rhode Island, but one was here off Gay Head. Mixed in with a bunch of scup. Several years ago there were some bluefin tuna mixed in with the bonito at the Hooter. That was exciting. It’s not uncommon for warm-water species to travel north with the Gulf Stream and then come inshore with a pocket of warm water that swirls off the stream. Years ago, we ran into a school of breaking fish in Manasquan Inlet, in New Jersey. We assumed they were snapper blues until we caught some and realized that they were small jack crevalle. Also, I think some southern species have started to expand their range to the north because of rising ocean water temperatures. Tell us about your clients. Each year, about half my charters are with new people, and half with repeat clients. One of the things I enjoy about this work is that I get to spend each day with different people, and I’m lucky because they’re usually in a good mood — they’re on vacation and they’re here to have a good time. 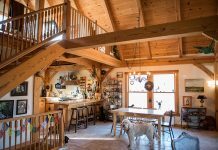 What I’m most proud of are the repeat clients, families that come back year after year. It’s very gratifying to see them every year, to see the kids grow up, and to feel that this trip is an important part of their vacation. Part of my job is teaching people. In fact one of my past careers was as a teacher. I think that goes well with what I do now. I taught chemistry and physics, and before that I worked at Merck as a research biochemist. I love hearing someone say, “That’s the biggest bluefish I’ve ever caught,” or “That’s the first bonito I’ve ever caught,” but it’s also very satisfying when someone leaves my boat having learned a new fishing method, or improved their casting or fish-fighting technique, or learned something new about fish, or how the rip forms on Middle Ground, or even a new knot. Some of my clients are really serious anglers, others are families just looking to spend a pleasant day on the water. 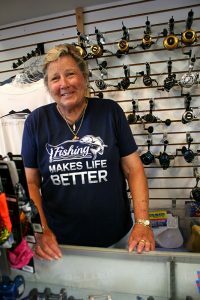 I love being on the water and I love to catch fish, and I enjoy sharing that experience with my clients, and I work really hard to make sure they have a good day on the water. What is your favorite fish and way to cook it? My favorite fish to eat is black sea bass. I almost always cook it by breading it and frying it. We sometimes use crunched-up Ritz crackers for the breading, and sometimes panko, and sometimes panko mixed half and half with shredded coconut. So that’s my favorite. 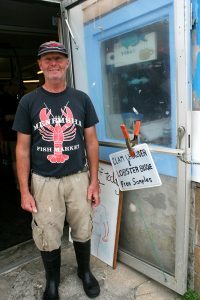 Stanley Larsen, owner of the Menemsha Fish Market. Since I was a kid. I’m the third generation on the Island. My mother’s family, the Smiths of Edgartown, go back several more generations. My grandfather came as a fisherman, a boatbuilder, and sail maker. A bunch of people on my father’s side and a bunch of people on my mother’s side fished — family members with different occupations surrounding the fishing industry. Right now, I fish with my son. My wife and my daughter fish with me in the wintertime, when we do shellfishing, scalloping, and oyster fishing. I’ve always been doing it, and I think I know what I’m doing, and I like to do it. In the summertime we leave before daylight; in the wintertime we get going right about daylight. We don’t miss many days, that’s the way you need to do it these days. You can’t fish one or two days a week and expect to make any money at it. I grew up right here, so it’s kind of like home. This [the fish market] is actually my home — I go to my house to sleep and eat, about a mile away. My wife works here at the market now. She’s the stabilizer of the whole system. This is our 14th year, year-round, seven days a week, and a lot of those days are 12-, 16-hour days; some are 18-hour days. When you figure it all out, we’ve been here close to 50 years’ worth of workdays combined. What is your most popular fish to sell at the market? Local lobsters … we sell a lot of local lobsters, caught by the local boats. We try to stay away from the Maine lobster and Canadian lobster. In the summertime, the Maine lobster is just coming out of his early shed, the yield is only 6 to 9 percent. The yield on the local lobsters is 9 to 16 percent, so you are getting twice the meat out of the locals. Sea bass this year is having a long season; we’ve been selling a lot of our sea bass at half the price of other years, and it’s what the local fishermen are harvesting. The fishing industry is pretty tough, but we rely on our local Islanders’ support, particularly throughout the winter. What is your favorite fish to catch, and how do you cook it? It used to be swordfish, but now fluke. Fluke can be fried, baked, or stuffed with crabmeat. Right now, we have sea bass which makes a great chowder, with potatoes, onions, and celery. Next article What I know about outdoor showers: Ten tips for getting the most out of one of life’s greatest pleasures.